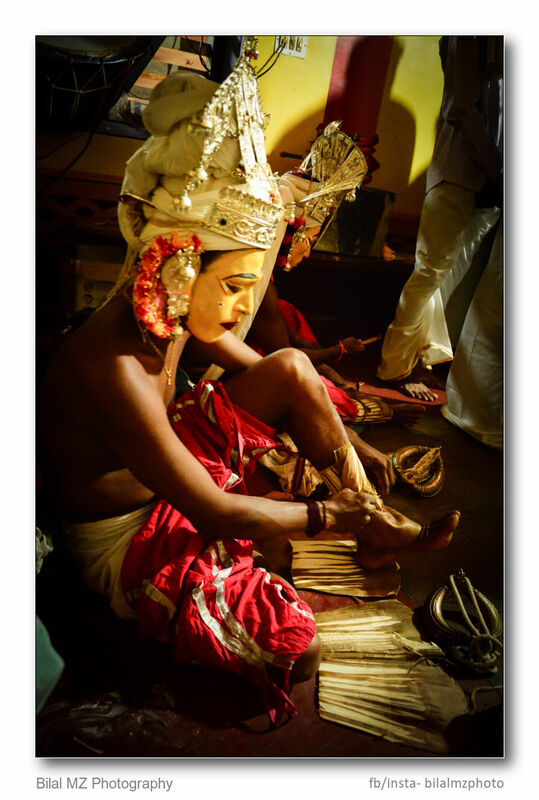 Bhuta Kola is one among many traditions of culturally very rich region of Tulunadu (region in South Indian coastal belt). Kola or also known as Bhuta Kola is a form of worship of Bhuta (spirit). During Kola the spirit possesses the body of the impersonator to communicate with the mortal human beings. 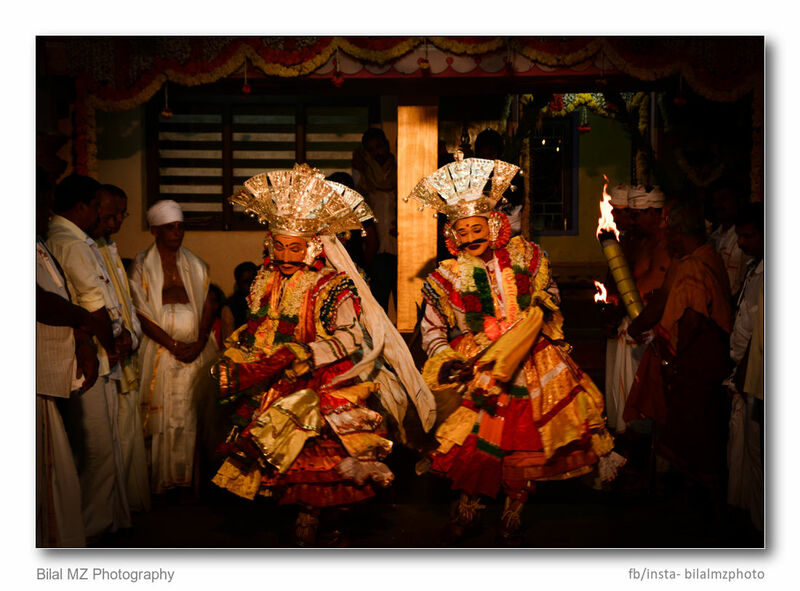 Bhuta Kola is ritual practise followed by the people of Tulunadu. 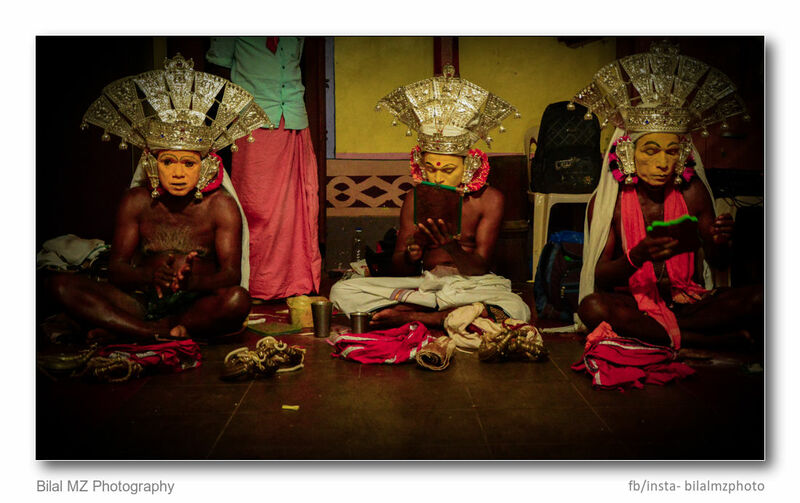 The belief is that Daivas are Gana’s (Spirits created by gods to take of humans) of gods . The gods sent Daivas to a earth when the humans were in troubles due to demons. The Daivas saved human’s from the demons and stayed on earth and were worshiped by humans. 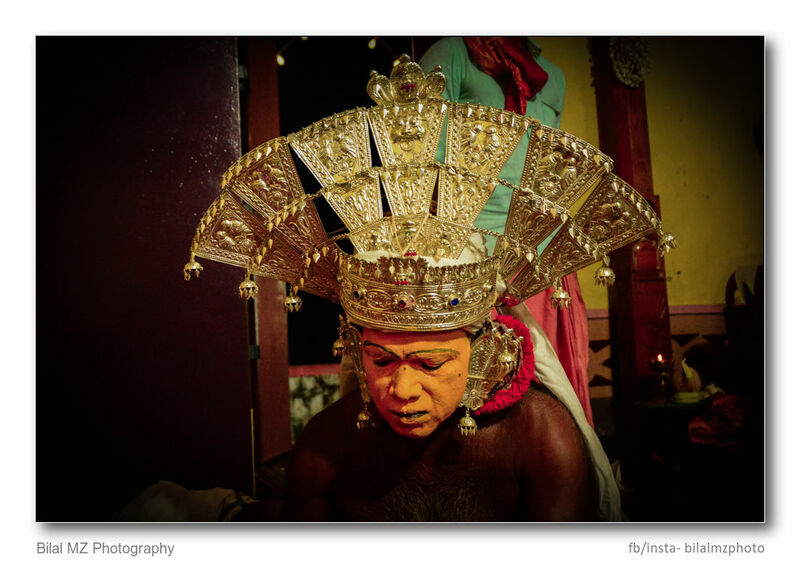 The Daivas aka spirit enters into the body of impersonator after the rituals performed by the impersonator to communicate with its subjects in human form. After the impersonator is possessed by the Daiva the Daiva (In the form of impersonator) starts to dance. As the dance progresses the possession becomes higher until the imporsonator is completely possessed by the Daiva. After possession the Daivas are offered by the offerings which depend on the type of Daiva. After the offering the Daiva may talk to its subject and solve their problems regarding property problems, monetory disputes , robbery , breach of contract etc. There are different types of Bhuta kola where different Bhutas are worshipped. These pictures are of Garadi Kola where the deitis are Koti and Chennaiya. One more deiti is Kujumba kanjava who was a human being later converted into Daiva by Koti and Chennaya. I will be writing a blog on Koti and Chennaya and details about Kola in my upcoming blog as this blog is getting lengthier. The person to become a impersonator in Garadi Kola needs to be from Parava caste only. The impersonator puts on makeup which mainly consists of yellow paint made from natural materials. The process of making colours naturally is called as “Aradala” in Tulu micrlanguage. Most of the makeup used is made naturally. The impersonator in Garadi kola wears a ornament called Chapparakombu made of silver. 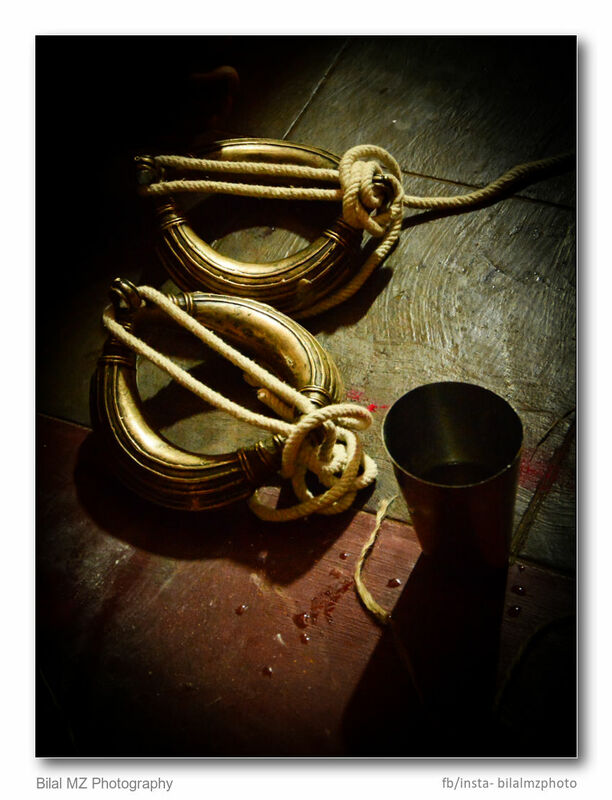 The brass anklets worn by the impersonator. This is a very important component of the costume of impersonator. Beremer also known as “Kemlatta naga bermer” is the lord of all the bhutas. As we have Mortal people as the kings of our villages Beremer is the king of the world of spirits aka Bhutas. The beginning of the dance , the beginning of possesion. As I was having severe fever during the Kola I couldn’t wait till late night where the Bhuta communicates with people. 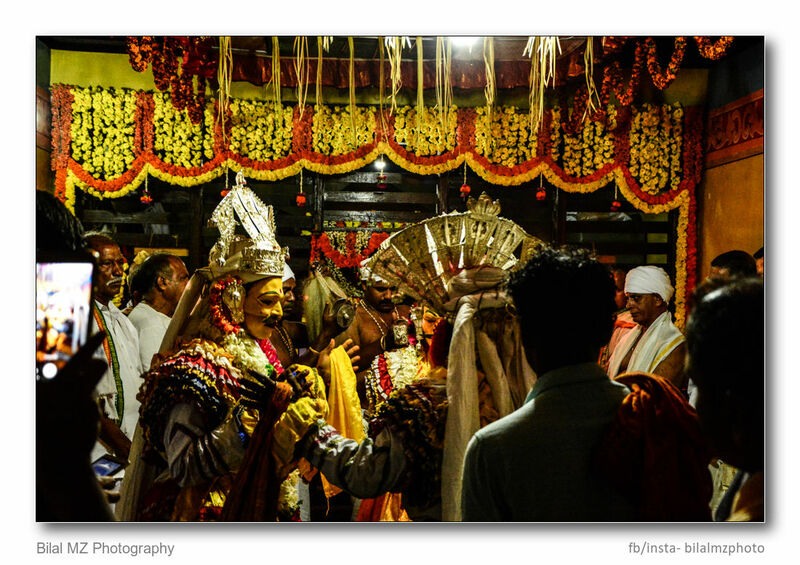 This dance is followed by offerings and the Bhuta talking with the people. A special thanks to Saurabh Shetty for providing me with the opportunity to click the pictures.